Book 1 - presidential assassin? Book 2 - special forces soldier? Book 3 - psychotic murderer? Book 4 - undercover spy? 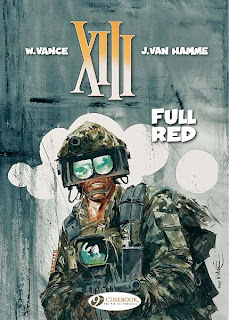 In the fifth XIII book, Full Red, writer Jean Van Hamme and artist William Vance take readers back to that presidential assassination from the first book and the repercussions of exactly why it happened. Leading on directly from the fourth book SPADS, Full Red sees XIII returning to the US with his ally the mysterious Lieutenant Jones and SPAD Sergeant Betty Barnowsky only to discover that the people behind the Presidential assassination are moving to take over the United States by tricking the new President and instigating a coup during a massive military exercise codenamed Full Red. The previous book, SPADS, gave a lot of information about the character of XIII and just who he might be and was rather exposition heavy because of it. Full Red takes this one step further being virtually a book of two halves, both halves being violent and bloody. The first half is more languid and explanation heavy as the characters return to the US and discover that the military exercise is about to happen more quickly than expected, while the second half moves into 24 TV series mode as they have to quickly infiltrate the US military's Supreme Strategic Headquarters in an attempt to prevent the coup taking place. While the book does feel uneven due to this spilt in how the narrative moves, this is a Jean Van Hamme story and he is more than capable of leaving the reader both satisfied with the conclusion but with enough threads hanging to want to get on with reading the next book. Indeed this fifth book brings the presidential assassination plot of XIII to a conclusion and provides a pause in the ongoing story of who XIII is, why he has a roman numeral tattoo and just who or what the organisation that uses tattooed agents is. Cinebook have taken the XIII books beyond both the previously published CatCom and Marvel translations and will continue the series into the next batch of stories at their ongoing rate of one book every other month. 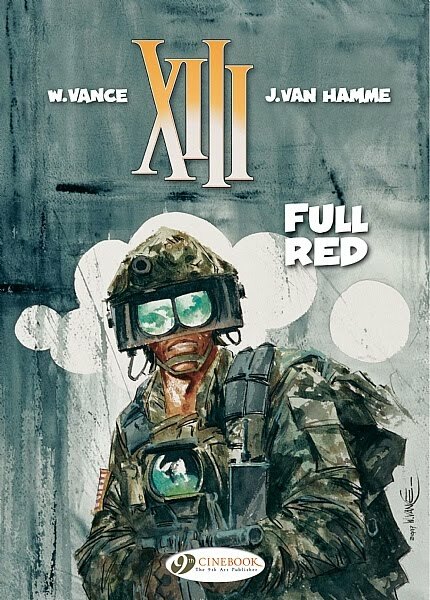 XIII is one of my favourite Cinebook series and Full Red shows that while the initial story of XIII is complete, there is a lot more to be discovered about the man and, fortunately, there are plenty more books in the series to enjoy those discoveries. • The entire 48 page XIII Book 1, The Day Of The Black Sun (reviewed here), is available free with issue 5 of Comic Heroes magazine which is currently available in newsagents. (updated 21/3/11, with thanks to Mark Stafford and David Lloyd) On Friday 8th April (the day before the London Kapow comic convention) London's Cartoon Museum will be hosting portfolio review sessions with Marvel Comics talent scout CB Cebulski, so anybody who thinks they've got what it takes should take along a selection of their work for an honest appraisal. V for Vendetta artist David Lloyd and Cartoon Classroom guru Steve Marchant will also be in attendance. Sessions are 12.30-2pm, 3-5.30pm, and 6-7pm. People will be seen on a first come first served basis. Entry is open to everyone at regular museum admission prices : £5.50 ( £3.00 for students. The Cartoon Classroom, a non-profit making venture, aims provide information for all officially recognised organisations who seek professional cartoonists to lecture and teach. It was also established to provide basic advice and information to any member of the public wanting to study cartoon art, graphic novels, strip illustration and/or the specialised writing skills linked to such work. "This event is the first physical manifestation of Cartoon Classroom's existence since its launch," David Lloyd told downthetubes, "and, because of that, it's of as much value to us as it is to those who might benefit from the event. 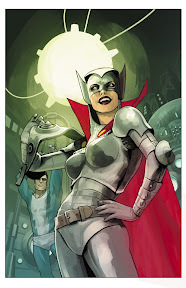 "This event is obviously a plus for folks who won't have a chance to see CB at Kapow," he continues, "and they can get help from me and Steve if they want it, too." The event came about after David suggested it to CB in his role as Cartoon Classroom ambassador, to do as a one-off standalone for anyone within reach of London, which was planned for long before Kapow. • The Cartoon Museum is at 35, Little Russell St, London, WC1. Call them on 0207 580 8155 for any other details. 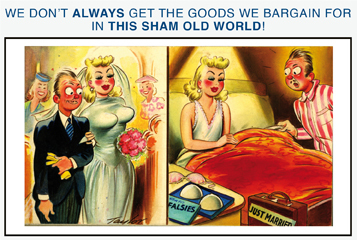 We don't always get the goods we bargain for in this sham old world! Arnold Taylor @ Bamforth Cards Ltd.
‘Marriage,’ as Elizabeth Taylor commented, ‘is a great institution’ - and she had more experience than most! As Prince William and Kate Middeleton prepare to tie the knot, London's Cartoon Museum is presenting a bouquet of barbed wit on the state of matrimony today and yesterday, with a new exhibition - Marriage à la Mode: Royals and Commoners in and out of Love. 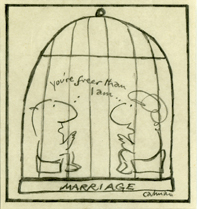 The highs and - more often - the lows of marriage have provided a wealth of material for cartoonists over the last 250 years. The exhibition, which opens next week (Wednesday 23rd March) includes over 100 cartoons on many familiar themes: the hen-pecked husband, the all powerful mother-in-law, the irritating personal habits and the battles of the bedroom. Since the 1960s, the divorce rate has climbed steadily and remarriage and ‘blended’ families have become more common. Royal marriages of the past have ranged from George, the Prince of Wales’s ‘illegal’ marriage to Mrs Fitzherbert in 1785 to Victoria’s idyllically happy marriage to Prince Albert. For almost 150 years cartoonists shied away from any hint of scandal and it was really only with the marriage of Charles and Diana in 1981 that the private lives of the royals became public once again. The ‘fairytale wedding’ excited unprecedented media interest, which lasted throughout the marriage, its intrigues and its dramatic demise. When Kate Middleton weds their son William on 29 April 2011, she will become the first ‘commoner’ to marry a royal close to the throne since 1660. Their relationship has inspired a number of cartoons, including Markosia's forthcoming book Kate and William: A Very Public Love Story, a graphic telling of the couple’s modern-day romance (see our news story), which is also featured in the exhibition. The show also includes Posy Simmonds’ telling observations on the complexities of marriages both modern and historical; Andy Capp and Flo’s ups and downs; comic postcards by Donald McGill and Arnold Taylor; William Hogarth’s revealing commentary Marriage A la Mode (1745), as well as cartoons by Steve Bell, Grizelda, Mel Calman, James Gillray, and over thirty other artists. • Kate And William: A Very Public Love Story will be sold in bookshops, select comic stores, supermarkets and all good outlets from 2nd April. 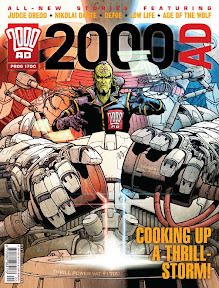 Along with a host of special events and Expo exclusives, including a huge 2000AD panel featuring the likes of Patrick Goddard, Gordon Rennie and Sean Phillips, a preview of the new Alan Moore: Storyteller book by Gary Spencer Milidge, a special STRIP Magazine launch promotion with John Freeman, Jim Campbell, Jim Alexander and Jasper Bark - and much more - it's now confirmed that Sydney Jordan, the creator of the great Daily Express newspaper strip Jeff Hawke, will again be at the event in May. 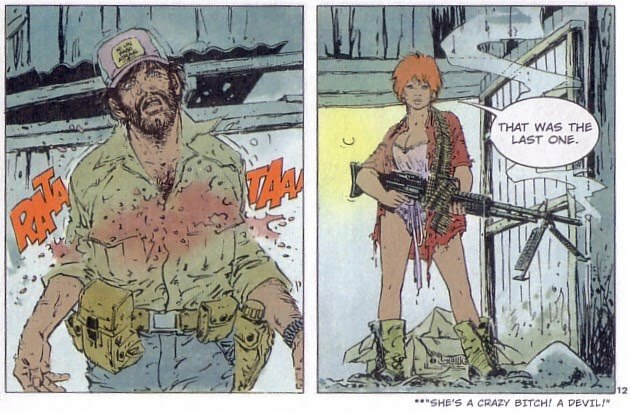 "Last year's Bristol International Comic Expo was a great success for the Jeff Hawke Club and we're coming back this year," says the club's organiser, Will Rudling. 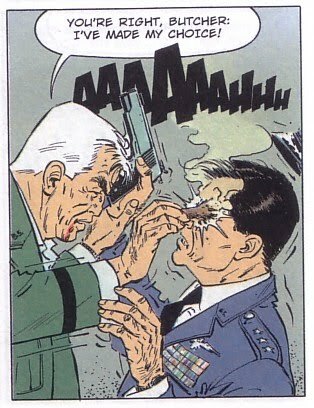 Sydney Jordan will be on hand to talk about Hawke and his other comics work along with Will Rudling, Editor and Founder of the Jeff Hawke Club, and master model maker Chris Tubb. Jeff Hawke original artwork will be on sale. The Club has almost completed reprinting all the early Jeff Hawke stories in its magazine, Cosmos, and is beginning to shift its emphasis on his transformation into Lance McLane/ Jeff Hawke. "We will be reprinting the Earthspace strips and subsequent stories in sequence," says Will. "The scenario is of a post-apocalyptic Earth struggling to survive and is very timely. Jeff and his android companion, Fortuna encounter fantastic adventures and deal with environmental issues. "This shows Sydney’s unique interpretation on the subject and the amazing plots he creates. It’s incredible how relevant they are now and so prophetic, they were since written 35 years ago!" Continuing podcast and radio show Panel Borders month of shows looking at newspaper comics, Alex Fitch talks to Chicago-based Audrey Niffenegger, fin artist and author of The Time Traveler's Wife, about her graphic novella The Night Bookmobile which was serialised in The Guardian in 2008 and is now available as a hardback collected edition from Jonathan Cape. 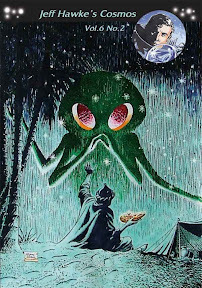 Alex and Audrey also talk about her picture books for adults – The Three Incestuous Sisters and The Adventuress – and the relationship between The Time Traveller’s Wife and the depiction of non-linear storytelling in comics, Doctor Who and the work of Jorge Luis Borges. The organisers of the Glasgow Comic Con are now selling tickets to the event on their new website. The event will take place in the deconsecrated Mackintosh Church in Glasgow's Queen's Cross near Partick Thistle's football ground on Saturday 18 June 2011. It will be an all ticketed affair with no tickets due to be sold on the day and 500 available beforehand. Adult tickets are £7.50, concessions are £5 and family tickets are £18. 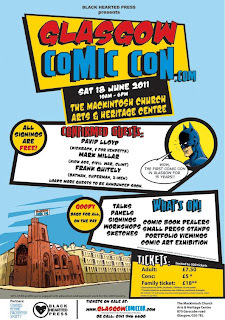 Guests announced for the day so far include artist David Lloyd, tying in with a screening of V For Vendetta at the Glasgow Film Theatre, and local writers Ferg Handley, Mark Millar and Gordon Rennie plus local artists Gary Erskine, Colin MacNeil, Frank Quitely and Stevie White. More guests are expected to be announced soon. All sales tables at the event sold out before the website went on-line which shows good local support for the convention although it does mean that faces familiar at other Scottish events, but who come from outside Glasgow, will not be represented in the dealers room. 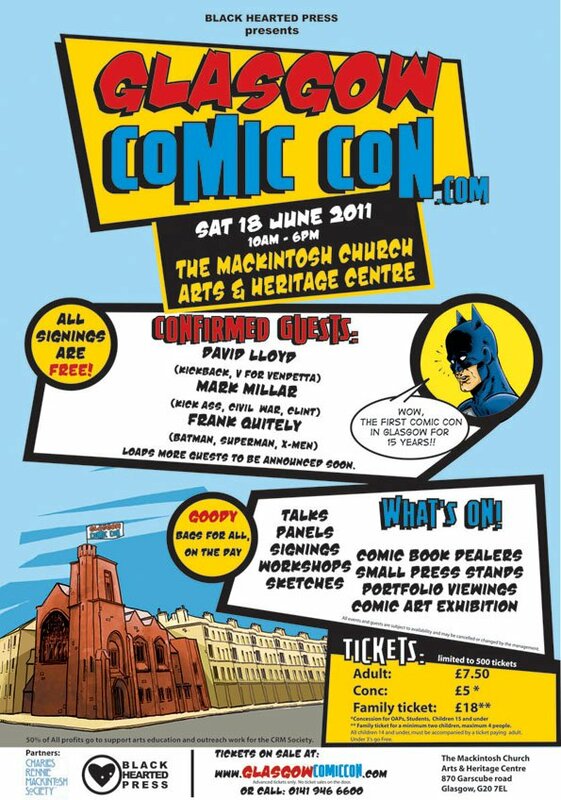 In addition to the daytime event the convention will be holding an additional smaller evening event in the church running from 8pm to midnight and described as a VIP party which will include the Scottish Independent Comic Book Awards presentation. Tickets for this event are only available to over 18s for an additional £5 per person and there are a maximum of 60 tickets. Details of the awards and how titles can be entered into them have yet to be released but the website describes them as "the first awards of there (sic) kind in Scotland celebrating independent creators, writers, artists and publishers." There are more details of the convention and how to purchase tickets on the Glasgow Comic Con website. 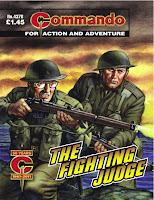 Along with information on the latest issues of war comic Commando comes news from DC Thomson that the long-running title will be published fortnightly this year - giving 104 doses of action and adventure to the title's fans worldwide. 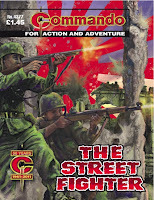 Originally Commando No 545, re-issued as No 1555. This story is taken from the pages of the diary of a true hero. 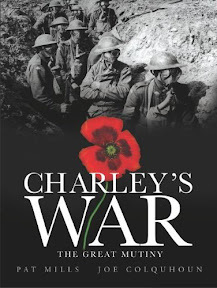 It tells of seven men’s fight to survive behind enemy lines with a traitor in their midst. It brings courage to life, tells of bravery of the highest order. 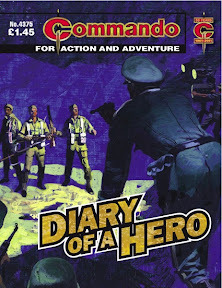 "This story had been one of my favourites as a young reader, read and re-read many times," says Calum Laird, Commando's current Editor, in a special introduction to this reprint issue from the comic's archives. "Then in 1981 - when I joined the staff of Commando for the first time - it was one of the stories I had to check over for re-issue. And re-read again. Now I’ve given myself the chance to read it through once more. "It remains a cracking tale," he feels, "full of Commando heroes, and with a belting sting in the tail. It’s wonderfully constructed and, with artwork by Cam Kennedy and Penalva, looks absolutely right into the bargain. "I like it as much now as I did in 1967." A battle in outer space tests G-Tex Wolf Brady to the limit – especially when a ruthless computer hacker makes his latest challenge even more dangerous! 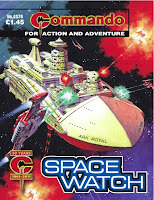 "Ricardo Garijo worked for Starblazer before Commando," notes George Low, former Commando editor, "and he brought all his sci-fi skills to this 1994 plot where Commando strayed off its usual course, taking to space… and beyond… with its linked G-Tex stories, the brainchild of writer Mike Knowles. "The futuristic script (this time by Ian Clark) set the tone for Ricardo to work his magic, while Ian Kennedy took a break from Spitfires and the like to tackle spacecraft. "What’s it about? Saving whales and the world for a start. Quite an undertaking and great to read." Not every confrontation between United States Marines and the Imperial Japanese Army took place in the steamy jungles of the South Pacific. The battle for Manila in the Philippines was a house-to-house struggle, pure and simple. This didn’t bother Marine Eddie Novak. In the war’s early fighting he’d lost buddies and now he was out for revenge, no matter when - or where - he got the chance. As a High Court judge, Mr Justice Jardine had a fierce reputation as a hard man. Hard but fair. His judgements were respected even by those on the receiving end of a verdict. When he joined the Army’s legal branch he remained the same hard but fair man. His working environment changed, though. Gone were the wood-panelled courtrooms, replaced by tents or makeshift offices. And another thing changed too. He picked up a rifle… to deadly effect. Cinebook takes us back to the fun of the old West with purdy laydies, saloon brawls and dangerous injuns, not this time in the regular company of Lucky Luke but in their less regular American civil war series The Bluecoats. The Greenhorn, written by Raoul Cauvin and illustrated by Willy Lambil, translates the 14th of Les Tuniques Bleues albums, Le Blanc-bec, into English for the first time. 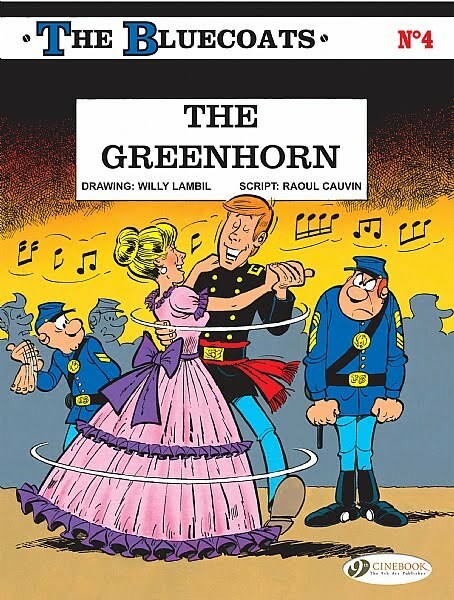 Originally published in 1978 over 16 issues of Spirou magazine beginning in number 2080 and first collected in album form in 1979, The Greenhorn tells the story of a new, young and very green Lieutenant in the Union forces who has just arrived at Fort Bow. Also arriving at the fort are the enthusiastic Sergeant Chesterfield and the reluctant Corporal Blutch, the Bluecoats main characters, in time for Sgt Chesterfield to totally get the wrong end of the stick regarding the new Lieutenant's intentions towards Chesterfield's not-quite-girlfriend Emily. This all gets out of hand very quickly culminating in the Lieutenant shooting the son of the local Indian chief and him being sent with the Sergent and Blutch to the Civil War front to get him away from the Indians while the Fort's commander tries to calm things down. Cauvin's script races along from the Fort to the saloon to the Indians to the civil war and back again and it is all very entertaining while Lambil certainly didn't have an easy time with the script considering the large number of characters seemingly in every panel but his art is more than up to the task. Last time when I was reviewing a Bluecoats book, The Skyriders, I found the combination of humour and war not really to my liking but there is much less of it here. 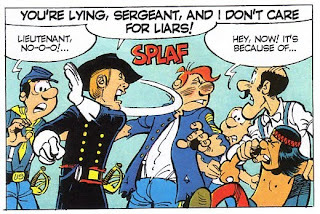 While in this book a major plot point is the Lieutenant shooting an unarmed Indian child in the back, it is done off panel and the horrified reaction of all the other characters to the event gives it a different impact to the killings in the previous book plus it emphasises the inexperience of the character. This book has sparked my interest in this series in a way that the previous didn't and while the next Bluecoats book is Rumberley, it would be good to see Duel Dans La Manche, with its European and English Channel setting, translated at some point. Part western, part rom-com, part civil war, The Greenhorn doesn't sound like it should work but it does and for those readers who enjoy the Lucky Luke books then The Bluecoats may well be another series worth trying. We're delighted to report that downthetubes has been nominated for an SFX 'Blogger' award in the category for 'Best SF News Blog' (Vote for us here!). Our nomination - pitting us against Big Dumb Object, the Doctor Who News Page and SF Crowsnest (all stiff competition!) is part of the first ever SFX Blog Awards, where the top-selling SF magazine celebrates the best that SF and fantasy fan-driven and insider-developed internet activity has to offer. "These awards aren’t for big, profit-making sites but for sites that were created for the love of the genre, and are maintained by people out of love rather than money," the magazine's team say. "They’re called Blog Awards, and while we do have many trad blogs among the nominations, but we’ve applied the term loosely to include a couple of less bloggy sites that still feel in the right spirit. Consider 'Blog' a shorthand term, because 'The SFX Fan-Driven And Insider-Developed Website Awards' just ain’t catchy enough." There are six categories to choose from, and the nominations, who also include our good friends Geek Syndicate in the 'Best Podcast' category and British comic creators Paul Cornell, Neil Gaiman and Warren Ellis in the 'Best Celebrity Blog' category, have been drawn up from suggestions made by members of the SFX Forum, SFX team members and the SFX Bloggers. All you have to do now is browse through the various nominees and decide which ones you want to vote for. Voters will be, to all intents and purposes, the Blog Academy, deciding the winners. Britain's Comic Book Alliance is putting together a fundraising comic to help raise funds to help earthquake and tsunami victims in Japan and New Zealand - and has put out an appeal for contributions. "I’m sure, like me, you’ve been horrified at the devastating effects of the two enormous earthquakes in New Zealand and Japan," says CBA's Tim Pilcher. "Thousands that have lost friends, family, their homes and entire communities." The CBA -- a not-for-profit organisation, primarily run by volunteers, dedicated to the promotion of British comic books, graphic novels, webcomics and sequential art in its many forms -- is looking for creators to provide some work free of charge so that they can put together an impressive package that will hopefully sell thousands and to raise as much money as possible to help those affected get back on their feet and to rebuild their lives. "The contributions can be around any theme (earthquakes, tsunamis, loss, hope, survival, what that country means to you, personal tales, whatever…)" says Tim, "and could be a pin-up, or a one to four page comic strip. 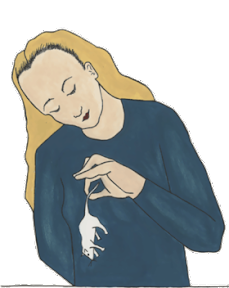 We may accept the odd prose piece from writers, but we’d like to like to keep these to a minimum, so please team up with an artist you normally work with." "Obviously, time is of the essence here, so we would like to get the work in within the next two weeks (Deadline Saturday 2nd April). I know that doesn’t give a lot of time considering your busy schedules but I do hope you’ll agree that it’s for an important cause. "Let’s show the world that comic creators care and how we can galvanise ourselves into positive action." • If you would like to take part please contact Tim by email via foundersATcomicbookalliance.co.uk for further details about formats, deliveries, or any other questions you might have. A quick mention for the latest issue of Whotopia, the Canadian Doctor Who fan magazine, which is a David Tennant special. Amongst the varied content is 'The Tennant Legacy', a look at how the David Tennant episodes have changed the show forever, by downthetubes contributor Ian Wheeler. The great thing about Whotopia is that is is available online and is absolutely free for everyone - check it out here. Voting is now open for the Eagle Awards, the annual prize given to the best American and British comics as decided by comic readers. We're pleased to report that as befits their British origins, the nominations include a substantial amount of homegrown talent and publications - including DC Thomson's Commando, some wonderful small press titles such as Futurequake and Paragon, and creators such as Paul Cornell and ace letterer Jim Campbell. We're also pleased to report that included in the nominations is the recent Charley's War collection by Pat Mills and Joe Colquhoun (and edited by me for Titan Books) - and Doctor Who Magazine (also edited by me in the dim and distant past, though I'm claiming no credit in the nomination, just delighted the comic strip creators for the title are getting some well-deserved recognition). Founded in 1977 by Mike Conroy and Richard Burton, the Eagle Awards are named for the groundbreaking UK. comic Eagle. Nominees are chosen with the help of comic book fans and the final victors are decided by popular vote. You can support your favourite creators, titles and publishers in 38 categories, which can be voted upon at this link. An awards ceremony will be held at London's MCM Expo on May 27, where the winners will be announced. The full list of nominees can be found below. Where possible, links are to official sites where known; if not, then to Wikipedia entries. Book links will direct to amazon.co.uk. 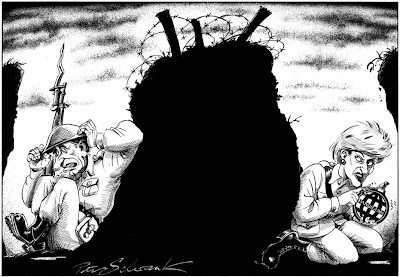 On Sunday 8 March 1936 the headline on DC Thomson's newspaper The Sunday Post was "Europe Alarmed - France's Retort to Hitler's Move - All Army Leave Cancelled". Inside however there was something a little more light hearted with the first episodes of the twin humour strips The Broons and Oor Wullie. That was the 1593rd issue of the paper. 3907 issues later, with a photo of the aftermath of the Japanese tsunami, the headline is "Death Toll Mounts" but The Broons and Oor Wullie are still there with two new stories and, especially for the 75th anniversary, a 16 page souvenir pullout. This covers the history of the two strips with details of their background and the people who worked on them including original artist Dudley D Watkins. Published for the first time is an early strip in which Daphne Broon attempts to elope with her lover, considered too strong for the paper at the time, and a panel that shows Wullie's younger sibling, simply referred to as "The Bairn", who was quietly ignored in later strips. The pull-out continues the fallacy that Watkins was on a Nazi death list but includes an "A-Z Guide To Broon's Blethers" for those who find the Scottish dialect in the two strips a challenge. The Sunday Post is on sale today, Sunday 13 March 2011, and costs £1.10.